With Google I/O introducing and hyping the tech company’s latest batch of products today, Google also announced a whopping 41 new features to Google+. Along side this update, it was revealed that there are currently 190 million active Google+ users – a number Google likely feels compelled to focus on in the wake of news about dwindling user activity. While Google Vice President of Engineering, Vic Gundotra, didn’t end up revealing every single one of the 41 features, one thing was clear from the handful we did a peak at: Google is building a “smart” social network that relies far more on algorithms like semantic analysis, image recognition technology, machine learning, and other types of algorithms to improve the user experience. Will this work? We’ll have to wait and see if Google’s strategy manages to erode some of Facebook’s market share. 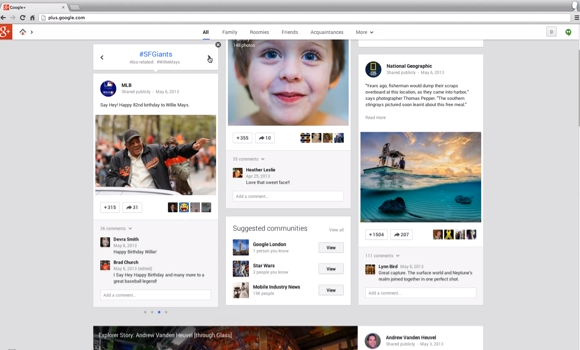 To start, Google+ wants to change how we personally filter through our friends’ posts. Facebook has us seeing the latest Facebook updates in the News Feed vertically in list-form. Google+ on the other hand is throwing that convention out the window. Google Plus’s stream will now be dynamic, meaning that all the content will be laid out in a multi-column design, keeping with the “Pinterestification” of the Web concept. Gundotra explains that a dynamic layout would provide a unified design across platforms. In other words, the only significant change when you switch between your computer to a smartphone are the number of columns you see on the page. Interacting with the content in your stream now has a “fun” element, as Google explains: Animations let you flip individual cards over, and status updates swing to the center of the page. These are simple but innovative ways to spice up the Google+ experience. 2013 may be the year of the hashtag. Facebook is reportedly working on supporting hashtags, and both Instagram and Flickr now recognize the feature. Google+ also supports hashtags, but is tweaking how they are fed into its service. Hashtags will be a core part of the app for content discovery purposes, since Google will show you similar posts with the same hashtag if you click on the tag, but Google+ will go a step further and tag posts automatically by scanning your post and figuring out what you’re talking about. So if you’re talking about Michael Jordan but don’t tag him, this new feature be able to read your post and do the dirty work for you so that your post can be included in other similar conversations happening within the network. In fact the algorithm that’s powering the auto-tagging functionality is sophisticated enough to recognize the subject inside of a photo and tag it accordingly – for instance Gundotra showed off a picture of the Eiffel Tower, and the post is tagged with the Eiffel Tower hashtag, but there’s no textual mention of the landmark. Of course sharing photos is a core feature, so much so that Google+ unveiled several tools to help make sharing photos far easier and faster – and of course, smarter. For instance, Google+ will now pick out the best photos from the ones you’ve uploaded to its servers by picking out the blurry photos, while the platform at the same time will suggest you to upload the photos that your close friends or family are in. It does this by mapping out your relationship with other users. And to follow up on its “smart” social network play, Google will auto edit your photos to make it look better prior to sharing. Storage space for photos will be bumped up to 15GB from 5GB. There are a slew of other features like smile detection, auto-created GIFs, panorama stitching, which we’ll have more details on later. Finally, Gundotra unveiled the messaging product that’s been creating so much buzz recently. First rumors and subsequent evidence suggested that its unified messaging platform would be named Google Babble and later Babel. This new release wraps up its currently fragmented messaging services, including Google+ Messenger, Google Chat, and other apps. They’re now collected into the Hangouts platform. 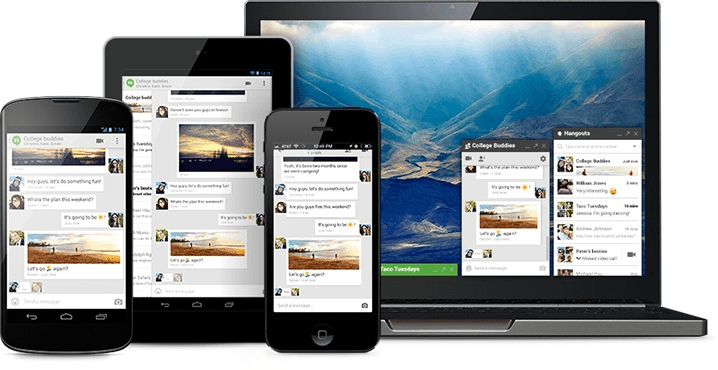 Hangouts will have all of the core features of the innumerable messaging apps you see on the market right now. Emojis and photo sharing will offer users a way to express themselves, as we’ve seen elsewhere, in addition to the boring (but fundamental) text messaging support. In fact there are 850 emoji for you to choose from, and they’re all hand-drawn. Now Google Hangouts is called Hangouts for a reason: It offers the capability to conduct face-to-face chats via video, like the desktop version of the feature. Now, with a piece of the existing Hangouts wrapped up into Google’s mobile messaging app, you can video chat with up to 10 people in a group. And that feature in particular will look similar to the Hangouts you’re familiar with already. Each participant in the video chat will show up as thumbnail-sized tiles, while the current speaker takes up the remainder of the screen. Many of existing Hangouts features will be available in these video calls. That includes visual and sound effects, the ability to watch YouTube videos together, and even an option to view other people’s public Hangouts On Air if you want. The one issue you might have is the fact that Google Hangouts doesn’t support SMS messaging. If you have Hangouts but would like to send a message to someone without the app installed, that type of action wouldn’t be possible right now. But the company is open to implementing the feature considering the volume of requests for it. The app is free and will be available on iOS and Android devices to start. It’ll also be available as a replacement for the Google Chat application that you’ve been using inside of Gmail. To upgrade to Hangouts via Gmail, just click on your photo icon in the Gmail chat list.